Indian rupee opens lower against the US. Dollar in the wake of the dollar index hitting a three-week high and the Chinese yuan’s continuing weakness. Pair USDINR now at 68.72 against its previous close of 68.62. We expect the pair to tip in range between 68.60-68.80 today. Indian equity indices has started the day on a bullish note on Thursday, with the Sensex gaining over 100 points, while the Nifty has reclaimed 11,000 in the opening quotes. The Sensex gains 106.61 points or 0.29% at 36480.05, while the Nifty rose bt 24.40 points or 0.22% at 11004.90. The market breadth is positive as 261 shares advanced, against a decline of 105 shares, while 40 shares are unchanged. Asian markets are mixed today. The Hong Kong's Hang Seng gains 0.23%, the Australian's ASX200 is up 0.31% while the Shanghai Composite is trading lower by 0.10%. European markets finished higher yesterday with shares in Germany leading the region. The DAX closed up 0.82% while London's FTSE 100 gained 0.65% and France's CAC 40 ended up by 0.46%. The S&P 500 hit a five-month high and the Dow rose for a fifth consecutive session on Wednesday as solid earnings boosted financial and industrial stocks and reinforced expectations for a strong second-quarter reporting season. The Dow Jones Industrial Average rose 80.29 points, or 0.32 percent, to 25,200.18, the S&P 500 gained 6.07 points, or 0.22 percent, to 2,815.62, and the Nasdaq Composite dropped 0.67 point, or 0.01 percent, to 7,854.44. The dollar index rose for the second day on Wednesday, closing at its highest level since June 28. Federal Reserve Chairman Jerome Powell, in his second day of testifying to the Congress, repeated his upbeat assessment of the economy. He said the U.S. economy was robust enough to handle tighter monetary policy. There was little respite for the yuan amid the ongoing trade tussle between the U.S. and China. The onshore yuan was trading 0.3% lower against the dollar at 6.7350, a one-year low. 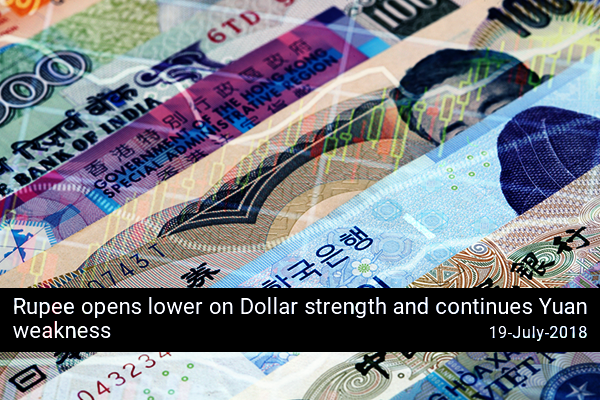 Among other regional currencies, the Thai baht and the Singapore dollar edged lower while the Korean won rose moderately. In economic data from the U.S., the month-on-month decline in housing starts was more than expected by economists and building permits too come in below estimates.